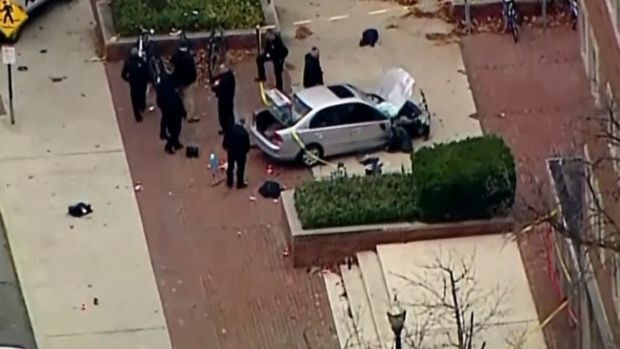 Investigators are looking into whether a car-and-knife attack at Ohio State University that injured 11 people was an act of terror by a Somali-born student who had once criticized the media for its portrayal of Muslims. The attacker, identified as Abdul Razak Ali Artan, plowed his car into a group of pedestrians on campus shortly before 10 a.m. Monday, and then got out and began stabbing people with a butcher knife before he was shot to death by a campus police officer, authorities said. Artan wrote on what appears to be his Facebook page that he had reached a "boiling point," made a reference to "lone wolf attacks" and cited radical cleric Anwar al-Awlaki, NBC News reported. Ohio State University officials give an update on the car and knife attack that placed nine pedestrians in the hospital after a male suspect rammed into them with a car and slashed at them with a butcher knife early Monday morning on Nov. 25, 2016. Two hours before that, a post appeared, saying: "Forgive and forget. Love. Artan was born in Somalia and was a legal permanent U.S. resident, according to a U.S. official who was not authorized to discuss the case and spoke on the condition of anonymity. The FBI joined the investigation. Ohio State University police Chief Craig Stone said Artan deliberately drove his small gray Honda over a curb outside an engineering classroom building and then began knifing people. Officer Alan Horujko, 28, who was nearby because of a gas leak arrived on the scene and shot the driver in less than a minute, Stone said. "It just hit everybody who was in front," he said. "After that everybody was shouting, 'Run! Run! Run!'" Eleven victims were taken to three Columbus hospitals. Most had been hurt by the car, and two had been stabbed, officials said. One had a fractured skull. 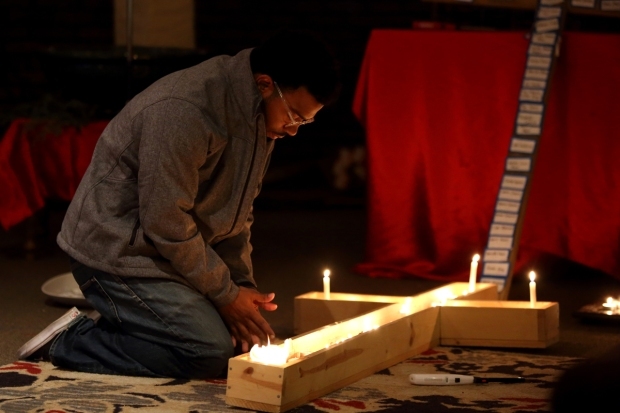 Classes at OSU were canceled after the attack, but were scheduled to resume Tuesday. Rep. Adam Schiff, of California, the top Democrat on the House Intelligence Committee, said the act bore the hallmarks of an attack carried out by someone who may have been self-radicalized. Artan was not known to the FBI prior to Monday's attack, according to a law enforcement official who was not authorized to discuss an ongoing investigation and spoke on the condition of anonymity.